What’s Next for Equity Crowdfunding? Crowdfunding continues to grow and mature as a funding source for small businesses. In the US, over the course of 2017, the first full year since the implementation of the JOBS Act, 636 businesses raised a total of around $270 million via crowdfunding campaigns. The UK market reached approximately £333 million of issuance in 2017, with headline-grabbing campaigns such as BrewDog's recent $30 million raise. However, as the market continues to grow and mature, questions are being asked of the deal structures being used, and regulators have moved in to update relevant legislation. Regulatory burdens in the US threaten the market's potential growth prospects. Title III of the Jobs Act, also known as Regulation Crowdfunding, was a way to allow companies to raise capital from both accredited and non-accredited investors with a lower regulatory burden. However, the act only allows companies to raise up to $1 million, therefore placing a ceiling that for many companies is too low. This cap was imposed primarily to avoid the risk of fraud. To address this issue, Title IV of the Jobs Act, otherwise known as Regulation A+, lifted this cap; however, it also placed greater regulatory and legal burdens (including prior qualification by the SEC) on issuers. This also inevitably increases the legal costs associated with such offerings, which, according to a recent study, averaged more than $100 thousand in legal and auditing fees. Crowdfunding legal and share class structures are being scrutinized. Most equity crowdfunding campaigns are done via share class structures which rank junior and/or carry less protection and governance provisions than those used by institutional investors and venture capital funds. Given crowdfunding investors' reliance on liquidity events for monetization, the absence of governance power and anti-dilution provisions puts them at a significant disadvantage. The UK framework provides an interesting case where tax reliefs provide early monetization for crowdfunding investors. This scheme is widely considered one of the main reasons for the market's growth so far. Another way to address the issue that has gained traction in the US has been the use of SAFEs with their mix of upside and liquidity preference protection. But SAFEs have been widely criticized for being "not so safe" since they rely on subsequent venture capital investments or liquidity events to trigger a conversion into equity. Lack of secondary market liquidity continues to drag on the market. Secondary markets for crowdfunded securities could be another way to provide liquidity and potentially an exit path to crowdfunding investors. Exchanges for small businesses already exist and include the likes of the TSX Venture Exchange in Canada or the German First Quotation Board with limited listing requirements. However, issues are still present. Given the low liquidity levels of these exchanges, there is significant risk of fraud and manipulation notably in the form of pump and dump (which is based on the dissemination of false information on a company, with the aim of inflating its share price). In November 2018, ECON voted on a final draft of the European Commission's proposal on crowdfunding regulation, effectively waiving the need for businesses to produce a costly prospectus when raising funding using securities for up to €8 million. This positive step has the potential to reduce an issuer's reliance on subsequent fundraisings, and to some extent, enables later stage financing. The regulation's final draft falls short though in bringing down the inherent barriers to cross-border crowdfunding within the continent. From the launch of Kickstarter in 2009 to the implementation of the JOBS Act in 2016, crowdfunding has come a long way, imposing itself as a viable alternative financing route for small and medium businesses around the world. BrewDog’s recent $30 million campaign via Crowdcube is a testimony to the maturity of equity crowdfunding, which in the UK reached £333 million of issuance in 2017. In the US, over the course of 2017, the first full year since the implementation of the JOBS Act, 514 businesses raised a total of $33.2 million under the act’s Regulation Crowdfunding while 122 businesses raised a total of $236.5 million under the act’s Regulation A+ (Source: Stradling). However, as the market continues to grow and mature, questions are being asked of the deal structures being used, and regulators have moved in to update relevant legislation. In this article, I will go over recent milestones reached in the US and the EU, highlighting what I believe are some issues that threaten crowdfunding as a tool for democratizing finance, and concluding with suggestions for a balanced approach in promoting its evolution. Despite the larger size of the US market relative to other jurisdictions, continued growth is likely going to be impeded by certain important regulatory issues. Title III of the Jobs Act, also known as Regulation Crowdfunding, was a way to allow companies to raise capital from both accredited and non-accredited investors with a lower regulatory burden. However, the act only allows companies to raise up to $1 million, therefore placing a ceiling that for many companies is too low. Why was the cap instated? A previous article on the Toptal Finance Blog untangles the issue, highlighting the fact that solicitations for financing to non-accredited investors significantly raises the prospects of fraud. 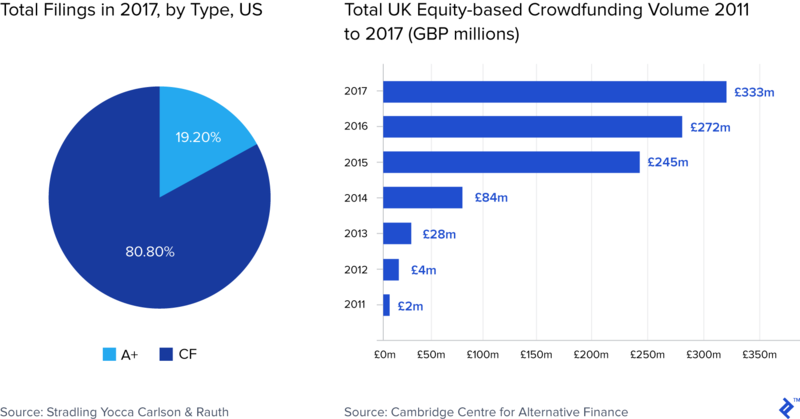 In fact, according to the Cambridge Centre for Alternative Finance, 42% of equity crowdfunding platforms in the UK now rate the risk of fraud as high or very high. To address this issue, Title IV of the Jobs Act, otherwise known as Regulation A+, lifted this cap, however, placing greater regulatory and legal burdens (including prior qualification by the SEC) on issuers. But this also inevitably increases the legal costs associated with such offerings, making them untenable for many smaller companies. 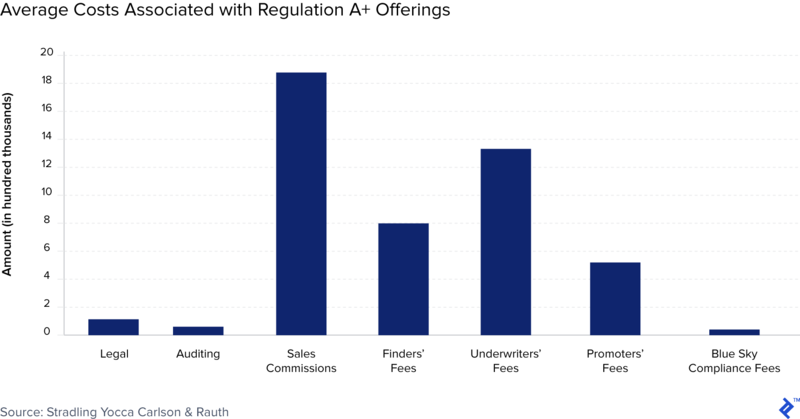 In a research paper on the impact of the JOBS Act since its implementation, Stradling Yocca Carlson & Rauth reports that listing under Regulation A+ averaged more than $100 thousand in legal and auditing fees. This is a clear impediment to increased accessibility. One of the issues that has become increasingly discussed in the equity crowdfunding industry pertains to share class structures and governance. Most equity crowdfunding campaigns are usually done via common shares, or other share class structures which rank junior, and/or carry less protection and governance provisions, than the share class structures commonly used by institutional investors and venture capital funds. This issue is particularly important if one considers the fact that investing via crowdfunding platforms is less of a dividend play than a capital gains one, making liquidity events essential in providing an exit to investors in the form of conversion or monetization. In the absence of governance power, and with other share classes with liquidation preferences and/or hurdle rates sitting above them in the capital structure, crowdfunding investors can be at a significant disadvantage. How to address the issue? The UK framework provides an interesting case where tax reliefs provide early monetization for crowdfunding investors. Seedrs estimates that approximately 80% of total issuers on its platform have qualified for tax relief, granting a tax break to investors ranging from 30% to 50% of their contribution. This scheme is widely considered one of the main incentives for crowdfunding investments in the UK and compensates retail investors for the lack of liquidity and exit opportunities by synthetically creating a bond-like floor to their equity investment. Another way to address the issue that has gained traction in other markets such as the US has been the use of SAFEs (Simple Agreement for Future Equity) with their mix of upside and liquidity preference protection. This instrument has been extensively used in the US since the implementation for the JOBS Act, reaching 22.4% of offerings under Regulation Crowdfunding versus 33.6% for common equity. But SAFEs have been widely criticized for being “not so safe” since they rely on subsequent venture capital investments or liquidity events to trigger a conversion into equity. Critics have argued that “…[a] SAFE was specifically designed for companies that are expected to successfully raise institutional venture capital financing in the near future, and we [expect] exceedingly few of the crowdfunding companies [to] actually be able to do so…”. This is particularly likely to be the case if crowdfunding is seen as a restrictive or a “last resort” funding route. One way to mitigate this is by involving institutional investors early on, effectively bringing greater due diligence scrutiny of businesses. Moreover, by involving venture capital investors from the beginning, companies who raise via crowdfunding are far more likely to go down the fundraising path which involves multiple financing rounds, thus making the use of SAFEs more effective. This was the case in the UK, where according to the Cambridge Centre for Alternative Finance, “… [institutional investors] accounted for 49 per cent of the funding secured in ”. Unfortunately though, having institutional investors participate alongside retail investors in crowdfunding campaigns is not always a happy marriage. Institutional investors necessarily require greater protection and preferential treatment, often at the detriment of other, in this case retail, investors. In the US, for instance, in an effort to attract greater institutional participation, certain crowdfunding platforms have tried to develop bespoke versions of SAFEs, but all too often, these are at the expense of the retail investors’ interests. The WeFund SAFE definition of liquidity events, for instance, does not include equity capital raisings by way of common shares. AngelList’s sister company, Republic, includes in its own version, an issuer’s redemption right, which is detrimental to retail investors. Finding a solution to the above dilemma is important to ensure crowdfunding’s sustainability in the long term. Possible options could be: a) expanding the definition of liquidity events as widely as possible, including venture capital fundraising, common shares, and even dividend distributions, as well as b) boosting liquidity preference multiples to provide a floor to an investor’s exposure. 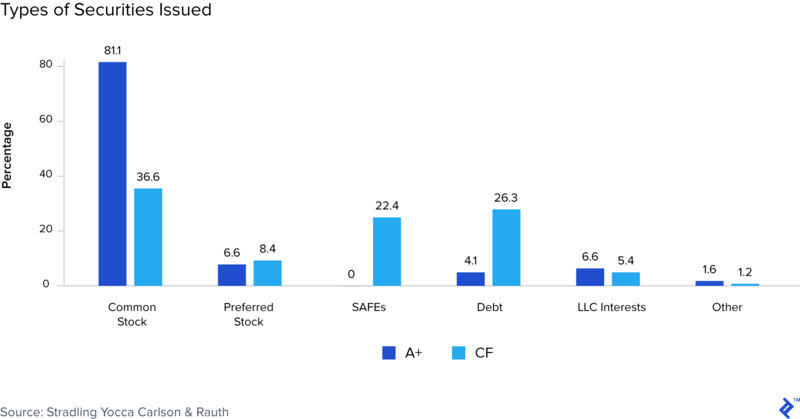 Finally, it is also worth noting that common stock offerings typically expose retail investors to the risk of dilution from subsequent capital raisings, regardless of whether they hold shares directly in a business or through a nominee structure. Far from completely offsetting this risk, a SAFE instrument would delay valuation up until a liquidity event, potentially involving sophisticated investors, takes place. It can also offset it in part by including valuation caps and/or discounts favorable to SAFE holders, indirectly transferring the dilutive impact to existing shareholders, which are often the original founders of the business. Following on the above, if crowdfunding investors currently rely exclusively on rare liquidity events for monetization, an alternative form of liquidity that has been discussed (and covered previously) at length in the crowdfunding space concerns secondary markets. Enter the idea of secondary markets for crowdfunded securities, to provide liquidity and potentially an exit path to crowdfunding investors. Exchanges for small businesses already exist and include the likes of the TSX Venture Exchange in Canada or the German First Quotation Board with limited listing requirements. However, issues are still present. As Janet Austin points out, these exchanges still bear the risk of fraud and manipulation notably in the form of pump and dump (which is based on the dissemination of false information on a company, with the aim of inflating its share price), particularly given the low liquidity levels of these exchanges. In Europe, regulation does not prohibit the transferability of crowdfunded securities but restricts the development of multilateral trading systems, leaving the door open for bulletin boards. Bulletin boards are similar to OTC markets but without a dealer (and therefore without a market maker). In 2017, Seedrs established the first secondary market in the UK in that form. It was hailed as a success following a share sale by online banking and crowdfunding champion, Revolut. The platform’s CEO later stated that it was one of the highest traded companies on Seedrs’ secondary market, with some investors realizing up to five times their money. But again, limited volumes are an important risk. In the case of Revolut, the business’ rapid growth and consecutive capital raisings in a short period of time helped determine a reliable share price. It is unlikely that most issuers will experience similar journeys. In fact, Seedrs’ own valuation methodology, certified by Ernst & Young, puts the emphasis on fundraising events to help it determine a share price (and so if a business hasn’t raised external capital in the last three years, the price declines). My opinion, given the above, is that this form of secondary market activity will be more of an add-on to concomitant primary offerings rather than a major source of liquidity going forward. Across the pond in Europe, in an effort to introduce uniform crowdfunding regulation across the European Union, the European parliament’s Economic and Monetary Affairs Committee (ECON) voted in November 2018 on a final draft of the European Commission’s proposal on crowdfunding regulation. It extends the maximum threshold stated in the EU Securities Prospectus Regulation, effectively waiving the need for businesses to produce a costly prospectus when raising funding using securities for up to €8 million. This positive step has the potential to reduce an issuer’s reliance on subsequent fundraisings, and to some extent, enables later stage financing. The regulation’s final draft falls short though in bringing down the inherent barriers to cross-border crowdfunding within the continent, which is clearly stated as one of its aims. Contrary to what was initially proposed by the European Commission, the adopted draft delegates to national bodies the competency for regulating platforms or, as they are referred to, the European Crowdfunding Services Providers (or “ECSP”) established within their national boundaries. This effectively limits the regulation from truly establishing uniformity across the European Union and indirectly enhancing liquidity by unlocking opportunities in underserved regions. Michael Harms the founder of crowdfunding.de commented on the limitations of crowdfunding in Germany, saying the market “is still small. [local] Regulatory constraints such as the exclusion of GmBHs, the limited liability companies which are the most common legal entities among start-ups, still put limitations on the market’s growth.” Furthermore, in seeking to align an ECSP’s interests with its investors’, the regulation now allows platforms to potentially participate in listed offerings for up to 2%. This optionality embedded in the wording of the final draft’s Article 7a, exposes platforms which have often strived to distance themselves from the responsibilities and potential liabilities of a gatekeeper to the risk of unwillingly signaling to the market a preferred issuer. In this context, it seems that regulators are so far content with moving the goalposts rather than decisively identifying and addressing the concerns of stakeholders in this expanding market. In particular, adequate protection through increased liquidity and exit opportunities is still a ways away. Equity crowdfunding works and offers a reliable source of funding for early-stage businesses. It is also an increasingly appealing route for fast-growing companies in diversifying their sources of funding at later stages. JustPark raised more than £6 million on Crowdcube after two crowdfunding campaigns alongside venture capital funding. However, as the market scales and attracts a greater share of savings, regulators will need to adopt a proactive approach in defining crowdfunding. As this article argues, the lack of liquidity and exit opportunities pose a threat to its sustainability in the long run and risk rendering it the preserve of fast-growing consumer-facing businesses. Moreover, further innovation is required around the structure and type of securities being used, and ideally the overall investment rationale, potentially using fiscal incentives. Common shares which too often do not hold voting rights may no longer be the most suitable crowdfunding investment securities, whilst the recent popularity of SAFEs must be assessed carefully to ensure retail investors are effectively protected. Security based crowdfunding is regulated by the SEC in the US, the FCA in the UK, and respective national regulators throughout Europe. Security-based crowdfunding offers access to transferable securities including equity or other debt-related instruments such as bonds. What is crowdfunding and how does it benefit the economy? It democratizes access to investment opportunities in early-stage businesses for retail investors. It essentially refers to online platforms listing businesses seeking to raise funding and enabling accredited and non-accredited investors, depending on the jurisdiction, to invest in such businesses. How do you make money from crowdfunding? Crowdfunding is risky and investors may not make a return on their investments. Depending on the security used by the issuer, several exits can be considered—e.g., equity investors can make a return if the business they’ve invested in completes an IPO or is bought by a competitor. Crowdfunding gives retail investors and issuers the opportunity to achieve a return and access funding respectively. However, it can be risky considering most issuers are early-stage businesses with limited financial history. Issuers can also suffer from negative press if the campaign is not successful. Bechara is a private equity professional with ESW Capital, a $5 billion software buyout fund, and a former investment banker at UBS, where he worked on $1+ billion transactions. He has worked with executives on corporate finance initiatives and advised on due diligence for M&A and fundraising transactions. Experienced with firms of all sizes, Bechara freelances to utilize his financial insight and experience to enhance value for his clients. Home › Blog › What’s Next for Equity Crowdfunding?